Former Ferrari F1 test team director Luigi Mazzola has joined the Venturi Formula E team as technical director. While Mazzola will officially take up his new role at the Long Beach round, he has been present at the previous two Formula E races to absorb the format and observe the team and paddock at work. He spoke at length to Current E in Mexico about his F1 experience, what he learned from Alain Prost and how he intends to shape Venturi’s future. “I started with Ferrari in 1988,” Mazzola says. He’s a tall man with long greying hair that whips around wildly in the breezy Mexican afternoon. We’re stood in the paddock of the Autodromo Hermanos Rodriguez, enjoying the afternoon sunshine a couple of days before the Formula E race gets underway. After gaining a PhD from the Politecnico di Torino university in Italy, Mazzolo went to work immediately for Ferrari. 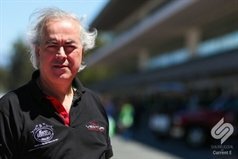 He would remain at the red team almost exclusively until 2009, working with a constellation of luminaries including Prost, Schumacher, Raikkonen, Brawn and Todt. Prost is now a key member of the dominant Renault e.dams Formula E team, of course, so at least Mazzola knows what Venturi is up against. But Prost may be taking note himself, however. A quick look at Ferrari’s record from the mid-nineties goes some way to vindicating that approach of searching for continual development. Mazzola, however, became disappointed that the technical marvels his team were capable of weren’t finding their way to the race track. (“You test with such good things and then you can’t work with them,” he said. “I didn’t like it anymore.”) He left the sport and started a business consultancy, training leaders.